Starting tomorrow at 11AM EST, TheOutnet.com is revealing some Marni merchandise. Pieces are quite pretty, and up to 65% off. Today only, take 25% off ankle boots for Endless.com's Friday Deal. BareNecessities.com has marked down some clearance items by an additional 50%. Ends Monday, Jan 31. Endless is fabulous, and they always have great promotions. I'm flagging today's for the Rebecca Minkoff lovers out there. Today's 20% off $100+ promo includes RM MAB minis, clutches, and even the black Nikki. And for those of you not into RM, the sale also includes Kate Spade, Kooba, Lauren Merkin, Linea Pelle, and Botkier. Oh, and Derek Lam and Roberto Cavalli sunnies. 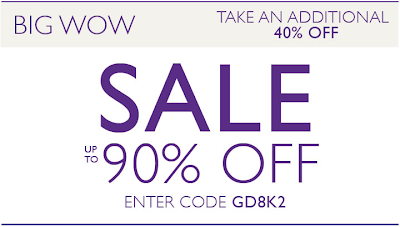 Discount is reflected in your cart. Ends Monday, Jan 31. 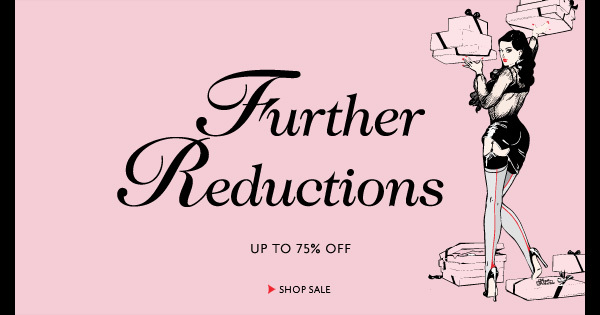 In order to clear it out, MyTheresa.com has taken an additional 20% off their winter sale (all of it!). It ends more or less Monday, Jan 31 (specifically 11AM CET on Tuesday, Feb 1). Today only, use code "WARMUP" to take an additional 30% off most of Piperlime's winter sale. This week ASOS.com is taking 20% off their private-label mens and womens clothing. I don't know why, but we better jump on this before it's over Monday, Jan 31. StevenAlan.com apparently broke yesterday, so to make it up to us, they've done some markdowns. Although I would say they should probably spend some time on their broken email, because none of the links work! 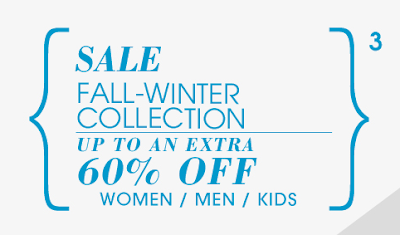 Take an additional 10% off Inhabit's ongoing winter sale. Use code "SALE10" through Tuesday, Feb 1. In all her US boutiques, Catherine Malandrino is marking down some accessories up to 60% off. Goodies include shoes, bags, and jewelry. Take an additional 50% off Calypso St. Barth's sale, both online and in-stores. Use code "JANSALE11" through Monday, Jan 31. There are some AG corduroy pants that are now around $50. 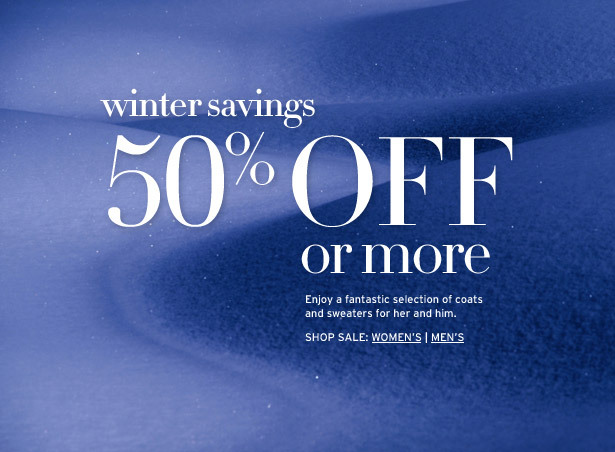 Nordie's has bulked up their winter sale with coats and sweaters at 50+% off. 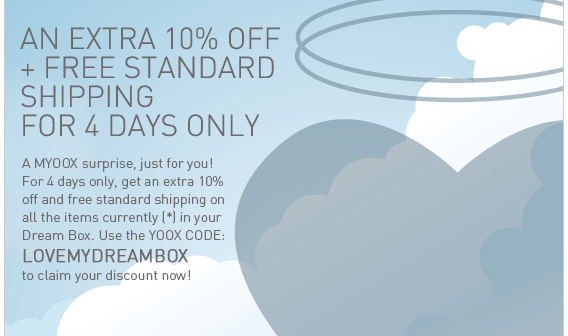 For the next four days, take 10% off items in your Dream Box plus get free shipping! Use code "LOVEMYDREAMBOX". Ends Thursday, Jan 27. Today only, Lucky Magazine is teaming up with Hanky Panky to offer their signature lace bikinis at 50% off (all sizes, all colors) today only. Use code "luckydaily1". Gilt Groupe is selling tickets for their NYC warehouse sale. $10 gets 1 person in the door at a specific time. Oh yes. Kiki DM at 75% off. Count me in! Happening simultaneously in NYC and LA. A few cute styles of Hanky Panky undies on sale, including low-rise in Vanilla! Plus UGGs, for those of you who must have them. And, to top it off, some Longchamp Le Pliage bags. Not a bad sale if you ask me. Let's see what we can see, shall we? Sorry, I have been sick with a stomach virus, spending my past few days laying in bed, shivering and sweating at the same time and having massive stomach cramps. It hasn't been fun! However, I'm feeling better now, and I wanted to post this great deal. A $20 Amazon.com giftcard for $10. It's one of those daily deal things, and this one is from LivingSocial.com. Hop on it before it ends in 13 hours! UK label Reiss is trying hard to clear merchandise for spring. Up to 70% off, and there are some super cute dresses less than $100! I love this sale, always. Up to 70% off online and in-stores. 50% off or more! Hurrah! FarFetch.com has a nice selection of sale merchandise for both men and women. The good news: there's a nice VAT 'discount' for us Americans. The bad news: $50-60 shipping from Italy, France, etc. Uf! Me & Ro has a fairly large (for them) selection of sterling silver and 18K gold items at 50% off. The cheapest item is the set of 3 cloud rings for $100, but despite the discount there are some real eye-poppers still at $800-$1200+. Get it while the getting's good, or if you're feeling lucky, hold out for the Barney's Warehouse Sale. Shipping is free. If you live in Philly, you'll want to head to boutique Joan Shepp for the Basement Sale. Up to 70% off those fab lines she carries in store (like Dries, Givenchy, Junya Watanabe-- those guys). MyTheresa.com is having their final winter clearance. 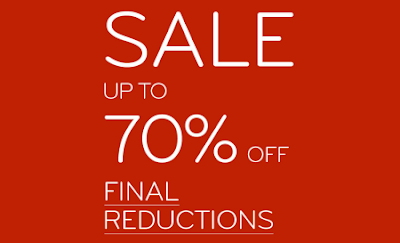 Up to 70% off. A lot of the premiere designer stuff (McQ, Philosophy by Alberta Ferretti) is still at 50% off, but that still isn't bad. There's stripe-y things by Sonia Rykiel, a pair of cute Wolford tights, and a lot of Halston Heritage. And there's a mens section too! Inhabit NY has some cashmere goodies on 50% markdown. I'm actually quite shocked they didn't do any discounting prior to Xmas or immediately after Xmas, but here it is. Footcandy Shoes is having a clearance of their old stock. Up to 80% off a selection of Alexander McQueen, a pair of red patent CL wedges (sizes 6.5 and 8.5 $260! ), Pucci, Zanotti, Jimmy Choo, Manolo Blahnik, Kate Spade, and many more. Styles are pretty trendy, so it may be hit or miss, but you definitely can't argue with the prices. And I noticed that not all the styles are on the label's page, but for whatever reason "Matt Benson" seems to bring up a good bulk of the entire sale. Lots of fun little gifts, but quite a few sold out ones too, so don't get too emotionally invested :) Use code "GD8K2" to take an additional 40% off the sale stuff! 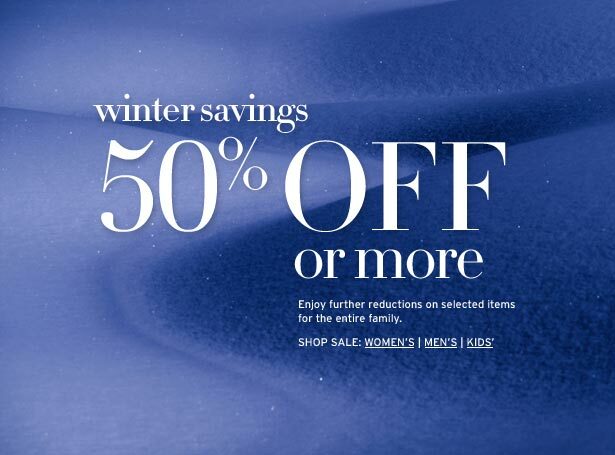 Saks has both added merchandise and reduced prices. Sounds like win all around! Take an additional 20% off items in Piperlime's Lime Tag sale. Use code "SMILE". Ends Monday, Jan 9. J.Brand jeans for $94.99 anyone? 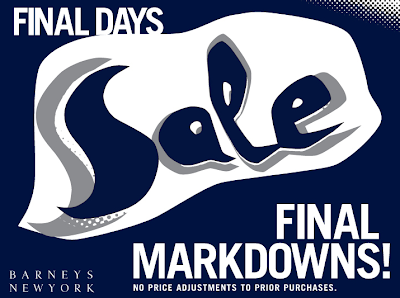 DKNY.com has also put a nice selection of things on sale. Tibi.com has put quite a lot of things on 50-70% markdown. If you're a fan, definitely worth checking it out! Both online and in the Philadelphia boutique, Joan Shepp is having a sale. 50% off. P.S. if you wear size 39, these shoes are to die for! $380!! Although the discounts are not near 50% on the balance, there are still some good finds in the Luisaviaroma winter sale. Like this gorgeous Givenchy multi-chain necklace which is now $1627.80 (that's half off AND it includes international shipping and import taxes). You'll have to pay in pounds, but for 70% off, it might be worth it. If there's something you were teeter-tottering on, time to check it out. ASOS adds to their sale. P.S. if you use Mintbox, they have 5% cashback. AP has taken their sale prices down a notch. My closet clean-out project continues, and I cannot express how happy I am at making everything neat and orderly! I also want to share my opinion on the new Runway Collection hangers from Kirby Allison's Hanger Project. In short: they are totally awesome. They completely exceeded my expectations. The hangers are sturdy, gorgeously constructed, and shiny! And although I was skeptical of how good the felt ends could be, trust me, they are very grippy. So grippy that it was actually a bit difficult to get all my clothes on to the hangers just so. But once they're on, they're not going anywhere! Absolutely no slipping, and from the few knit pieces I dared to hang, I have to say I'm not seeing any stretching despite the weight of the sleeves/body, which is pretty impressive. I wear a size 4/40, so all my hangers are 15", and they are perfect. One thing, though... As I do live in a teeny apt with a very cramped closet, I'm starting to realize that all the blouse and jacket hangers with the shoulder flares take up a lot of valuable real estate. If you're in my situation, I recommend skewing your order towards the skinny shirt hangers. (See comparison pictures below-- those are equal 2' widths of hanging space). As I've been re-hanging and reconsidering my wardrobe, I've pulled out almost 100 items I should donate. It seems quite nuts to me that I could have 100 pieces of clothing (tops, skirts, sweaters, pants) that are just literally just taking up room. 100! So between my little sisters and charity, now I just have to decide who to give what!